Deaf dog: Bonnie is a 2 year old Boxer, who is a very calm girl that loves attention and affection. Other pets: Just the three of us and the fish! Cookie passed on peacefully on March 7, 2002. She was 16 years old. Winnie is now 5 years old, and has been competing in agility trials for over a year. Abbie was adopted in September, 2001. 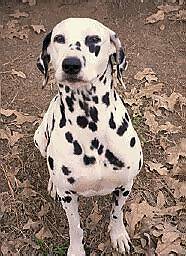 She is a 2 year old deaf Dalmatian. Other pets: Molly, 11; Maggie, 4; Anchor, 10; and 3 cats. Deaf dog: Sigh is a sweet, beautiful one-year-old Border Collie who has just graduated from Basic Obedience. Sigh came from Border Collie Rescue in Texas after being dumped at a shelter when her previous owner found out she was deaf. Deaf dog: Rootie Tootie is eleven this year. 'The Root' is at his job daily; digging up gophers, hunting for rats, barking at the big crows, and chasing the pigeons out of the barn. He is still competing in Veteran JRTRacing, and still having his moments in the winners circle, with the Championship, or Res. Champion of the show. He is competing in an age group that is 6yrs and up. Pretty good for an older dog! His other favorite sport is ball toss, he is always in the ribbons in that game, also. Rootie is the owner of All balls, chewies and whatever spot he choses to be on the bed from the other 'hearing' JRTs that he lives with here. Rootie goes to several dog charity events a year to help educate the public on the perils and pleasures of owning a JRT. He, also, is proof that a non-hearing dog is capable of being a wonderful pet. Rootie is an ambassador for JRT Rescue. Last year he competed in the Incredible Dog Challege in JRT racing, he was introduced as a rescue and deaf competitor. He did very well and the crowd roared for him. They were amazed at his ability responding to hand signals. Many in the crowd were waving at Rootie instead of voicing a 'hello', he would wiggle and flag is tail for them in response. He surely has been a gift from God, teaching me more about dogs then any hearing dogs, that I have owned. I believe that Mr. Rootie Tootie and I will be together until the Master calls, for either of us. He will always be in my heart, with his spirit, way after he may be gone. Deaf dog: Joy is a 1 year old English Pointer. She is a wonderful dog and loves to play. 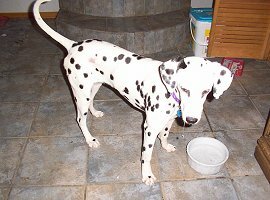 Savannah is an 8 month old Dalmatian. Savannah was rescued from a high kill shelter. She was surrendered to the shelter by a fire chief. Savannah was terribly underweight, covered with fleas, ticks, demodectic mange, and had several open sores oozing with puss. She was very ill and was on IV fluids for the first 3 days that I had her. I rescued her intending to find her another home, however, I knew she was "mine" from the moment I set eyes on her! She is beautiful, sweet, happy, and loving. She has been such a gift to our family and we love her dearly! De'Vil is a 12 week old Dalmatian mix. She is my little pumpkin! She is the sweetest most loving and adorable pup! She was rescued from an idiot who was giving her away at a Walmart to anyone who would take her because she is deaf. He claimed that "she was the first one he wanted to get rid of". She is learning quickly but is a little monster at times! We love her dearly! Human companions: Jennifer Smiadak and her 8 year old daughter. Other pets: 6 other hearing dogs, 6 cats, horses, sheep, goats, bunnies, cows, and birds. Also several foster dogs. Deaf dog: Inca Garcia is a 9 month old Mini Pincher. She is very lively and affectionate. Gets into everything she can. Loves to nip at your nose. Loves to play!!! We Love Her!! Other pets: Sparky - older dog, male. Keeps Inca busy. Very loving dog, he loves to lick and lick and lick. Deaf dog: Charlotte is a 7 month old Australian Cattle Dog, whose family knew she was deaf when they got her. Human companions: Ellen Fox-Blake & Chris (expecting a little one). Deaf dog: Scope is a 1yr old Lab/Bull Terrier Mix. Her owner writes: We were foster parents through a local rescue organization. Scope came to us because she was considered too hyper and unresponsive to people. We fell in love with this "Problem Child" and adopted her, when most everyone had given up hope. After several months we realized that she is deaf. She is extremely intelligent, and can hear sounds, however according to our vet her auditory nerve is not functional, so she is unable to process the sounds she hears to identify their source or content. She picks up queues visually, through vibrations, from us, and from her hearing sister, Madison. Scope is learning signs, much faster than her hearing sister who we are also training. She is a much calmer, happier dog since we discovered that she isn't being stubborn, she just cannot hear. We love her to death, and cannot imagine what our life would be like without our Scope-a-Rope! Other comments: This is a great organization and really helped me when I was trying to learn why my baby was not listening to me. Deaf dogs: Ruby is a 3 year old Catahoula. "Ruby is independent, defiant, intelligent, lovable, trustworthy, bipolar, and one of the few dogs I'd ever trust to watch my back." Sabrina is a 5 year old Great Dane. "Sabrina is a beauty on the inside and out. She's demanding when it comes to sweets and stingy with her affections." Ranger and Job, both male Great Danes. Job was born without eyes. "It's not always easy living with seven dogs, but to be able to watch them all getting along and playing with each other, with no regard to physical limitations is an amazing display of their courage and ability to accept without conditions." Other pets: One more male Great Dane, Connor; a small mix breed female who sees and hears, Roxie; Chance, a Shar-Pei mix who was chained to a tree and neglected for the first five months of his life; Thurston, the iguana; Oscar, the ball python; four catfish and four silver dollars. Deaf dog: Bruzer is a 6-1/2 month old Chihuahua. "We rescued Bruzer from the Plano Animal Shelter in July. He was found wandering the streets at 3 months old he was so tiny. We didn't think anything was wrong with him in the beginning but then after a while we noticed he would not respond to noises and wasn't afraid of the vacuum. We love him very much, he is a very big part of the family. We have a mini Schnauzer also - she must know that he is deaf because when I can't find Bruzer she goes and gets him. When she finds him she barks and nudges him with her nose and then he follows her to me." Other pets: Pepper, a female Miniature Schnauzer; 2 cats, Ruby-roo and Sweetpea. 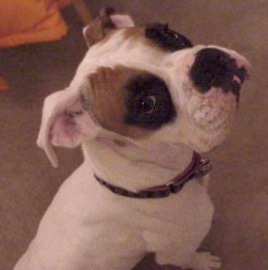 Deaf dog: Powder's human pal writes: "She is a sweet, petite white Boxer who I bought from a customer at our pet supply store. I got her at 4 months and she has become a creative problem solver. She can open cabinets and even unscrew the plastic cap from a jar of peanut butter. She has the sweetest little mushy face and smiles a lot. Her best trick is crawling along the yard commando style. We are planning on joining an agility group when she gets a little older." Other pets: Louis, Lily, and Mr. Hugh Jackman, a hearing white Boxer. Deaf dog: Jake is a RAMBUNCTIOUS, INTELLIGENT, STRONG WILLED, but otherwise well mannered dog. He loves to play, and always makes sure he is the center of attention. He loves to play ball and follows us where ever we go. He has already learned to sit and to lie down and we look forward to teaching him some more tricks.